An up-and-down season, one that began and ended in the seniors but had seven VFL matches in between. Roughead had 20 hitouts, 12 disposals and two goals in round one, but fell out of favour after round two and only appeared again in round nine. Importantly, he finished the season by playing the final seven home and away matches in the seniors before being traded to Collingwood in exchange for selection No. 75 during the October trade period. A pre-season hamstring injury sidelined him until round eight, but the versatile tall had a serviceable remainder of the year in the ruck. With the ability to play all over the ground, Roughead gives the Dogs great flexibility. Will face stronger competition for the number one ruck spot from Tom Boyd and Tim English in 2018. Played every game of the season except one to become the club’s number one ruckman. Using his athleticism to jump over opponents and cover the ground, Roughead is also a danger up forward with his contested marking. The former defender has formed a strong partnership with Tom Boyd in the ruck that gives coach Luke Beveridge plenty of flexibility. After being flushed in the eye by a football in the Preliminary Final win over Greater Western Sydney, he recovered to play his role in the premiership side. Appointed vice-captain at the start of 2015, the versatile big man played predominantly in the ruck with stints down back and up forward. His mobility and marking around the ground saw him become Luke Beveridge’s first-choice follower. A three-year contract extension will see him remain at the Whitten Oval until at least the end of 2018. Battled manfully on the league’s best forwards, but shoulder injuries finally caught up with him by season’s end. It will be interesting to see where new coach Luke Beveridge plays his best footy, as he’s impressed in the ruck and up forward with his strong marking. A highly regarded young leader of the club, some believe he could captain the Bulldogs in the future. Roughead enjoyed a breakout season in defence in 2013, shutting down some of the best forwards in the competition. He had a consistent year, featuring in all 22 games. In the home and away season, he led the AFL for one-percenters, including spoils, and finished 15th for contested marks. He teamed up with Dale Morris and Michael Talia to form the foundation of a sound defence. The young big man took another step in his development last year, though not in the direction most anticipated. After being groomed as a forward and a back-up ruckman, he surprisingly ended the year as a key defender. Needs to continue to develop his bodywork and ground-level play. Roughead was considered a standout ruck prospect after playing eight games and winning the Bulldogs’ Best First Year Player Award in 2010, but he struggled to build on those efforts in 2011. 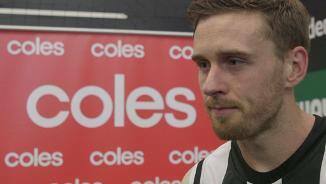 He played four games in the first six rounds as a back-up to Ben Hudson, but was not seen again until round 19 and finished with a season tally of nine games. The hot ruck prospect broke through for eight AFL games in 2010 as a support act for Ben Hudson. He played six games between rounds 15 and 22, ahead of Will Minson, as the Dogs tried to settle on their favoured ruck combination. He is also capable of being a strong contributor in attack. A shoulder problem ended his year after the home and away season, but he ended it by winning the Bulldogs’ Best First Year Player Award. Roughead met most expectations in his first season at the Whitten Oval, impressing in the ruck with VFL affiliate Williamstown. He missed the first four games with a shoulder injury and started in the VFL reserves, but soon showed his class and earned a promotion to the Seagulls’ senior side. The cousin of Hawthorn champion Jarryd Roughead arrived at the Whitten Oval hoping to strengthen the club’s ruck division after showing plenty of promise at TAC Cup level and in the National Under-18 Championships. Aside from his excellent tap work, Roughead arrived with good endurance and ground skills for a big man and ranked highly in the running and vertical leap tests at the Draft Camp. 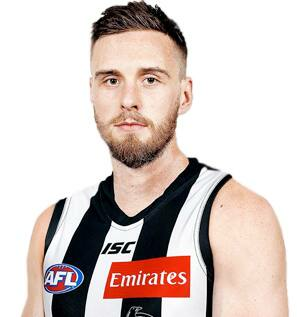 After 138 games at the Whitten Oval, Jordan Roughead made his way to Collingwood on the final day of the 2018 Trade Period. The 27-year-old was a member of the Western Bulldogs’ drought breaking premiership victory in 2016 and has carved out a reputation as a highly respected key position player who can play in a variety of important roles at either end of the ground as well as in the ruck. Roughead famously overcame a serious eye injury to feature in the Bulldogs’ 2016 flag, winning 17 hitouts, laying four tackles and collecting 13 disposals against the Swans.